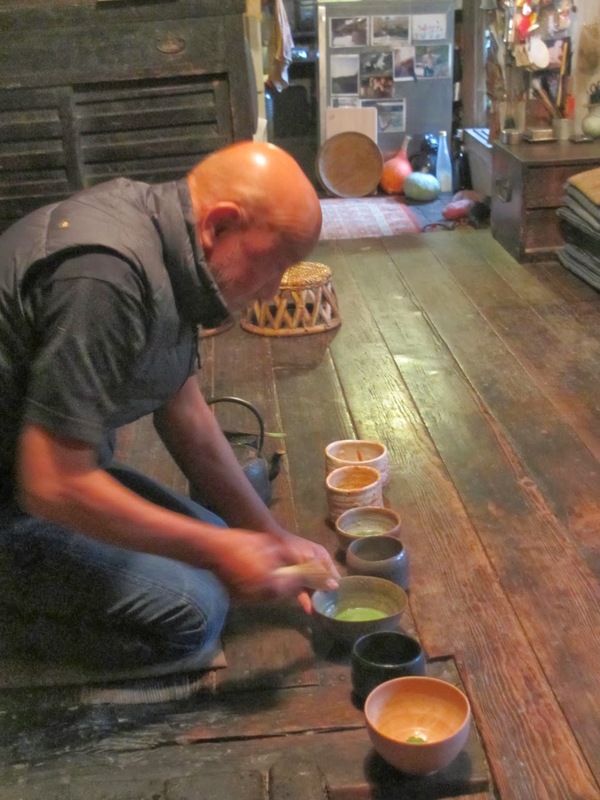 As the tour continued, we paid a visit to Tsujimura Shiro, a ceramic artist who is renowned outside of Japan as well as in his home country for his rustic Shigaraki tea bowls and usable vessels - vases, sake cups and pourers, etc. Tsujimura lives and works in the hills outside of Nara (the eighth-century capital of Japan) in a house that he built with his own hands, but also drives two Porsches and a Harley-Davidson. 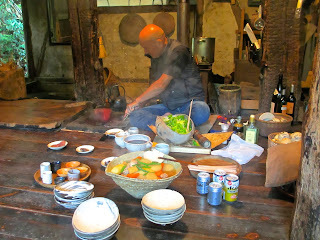 Visiting Tsujimura is quite an experience first, for the opportunity to admire his work and second, for the fantastic rustic lunch prepared by his wife, an amazing cook, and laid out on the wood floor of the aforesaid house, where the potter works the in-floor hibachi to grill steak and other items. Tsujimura beams with happiness as his guests enjoy the feast, which ends with matcha (powdered green tea) served in his wonderful bowls. Lunch at Tsujimura Shiro's. That's him working the grill. We left Tsujimura's well-fed and happy. Most of us had no dinner that night.